A new principal has taken charge at the John A. Dever Elementary School on Columbia Point. Dr. Todd A. Fishburn, a Pennsylvania native who is brand new to Boston, has a track record of turning around low-performing schools that are on the brink of failure. That’s the predicament that the Dever has been in for several years now. Categorized as a Level 5 school by the state’s Department of Education, it was put into receivership in 2014. Blueprint Schools Network, a Boston-based non-profit that has been charged with “turning-around” the Dever, is now entering year three of its management of the school. A Boston Globe story published last June reported that the Dever has continued to struggle on Blueprint’s watch— with enrollment declining from 583 to 498 last year. The school’s already dismal MCAS scores declined, too. There has been a turnover at the top –five principals in two years – that is the sort of churn that can leave a school in chaos. Fishburn’s appointment could bring the stability and incremental improvement that might be the last best hope for the Dever. 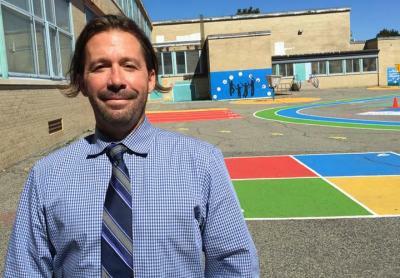 A former college wrestler whose love for sport brought him into teaching comes to Boston from the Seaford School district in Delaware, where has moved through a succession of leadership roles that generated positive results. In year one, the school met state required benchmarks for performance for the first time in ten years. The 44-year-old Fishburn isn’t promising that sort of pivot for the Dever. He says he has a 3 to 5 year plan that hinges on him building his own team of teachers and administrators, his main focus in year one. Focus groups that he convened with parents, teachers, and students over the summer were encouraging, he said. “They just love the Dever and that made me want to come here, knowing that the people who are here want to be here,” he said. More than a third of the 70-plus teachers are new this year. Another third are coming back for year two. The rest have been at the Dever since the start of the turn-around effort, a count that Fishburn finds remarkable. “They’re choosing to come back for a third year in a level 5 school. That’s huge,” he said. Fishburn is leaning on his own toolbox of expertise— he has a master’s in Applied Educational Technology – to better utilize high-tech tools in each classroom. The school has a complete set of Chromebooks that were purchased by Blueprint but have not been well used. Teachers are getting the professional development time they need to learn how to use the devices, and make sure they can teach the kids too. “If you’re a new teacher, it’s already a challenge, and now you’re asking me to use technology in front of my kids and what if it doesn’t work right away? We have a full- time technology specialist, and I directly supervise him. Each Wednesday is a half day for professional development and the expectation is that I want to see people using technology,” Fishburn said. Getting control of hallways, classrooms, and the play yard is Job One this year. On a tour of the school, the Reporter found it a quiet and orderly place, with directional lines taped on the hallway floors to guide foot traffic, an innovation that Fishburn and a colleague spent a weekend doing before classes started last week. He also had each teacher make a “positive” phone call to every parent last week to make an introduction — and get the year off on the right foot. With close to 90 percent of the Dever’s students living in families below the poverty line, and nearly 60 percent English language learners, bonding with families – and having their buy-in – is key, he says.